This Post has already been read 539 times. Every wonderful moment is worth being recorded. Quality images has always been considered a highlight of Infinix phones. The HOT 7 features a 13MP AF Camera with dual flashlight that captures more picture details. With a large aperture of f/1.8, it shows a clear and a high-quality shooting effect. In addition, the 3D DIRAC audio technology that has been well received by consumers in our previous generation HOT 6, has been extended in the HOT 7.It provides a full sound that is all rounded and suitable for both indoor and outdoor listening without the need for earphones. It adds wonderful color to your audiovisual feast. Smartphones carry too much privacy and important data in the digital age and it is especially important to use a more secure and convenient encryption mode. Infinix has always been designed to provide users with complete security services. 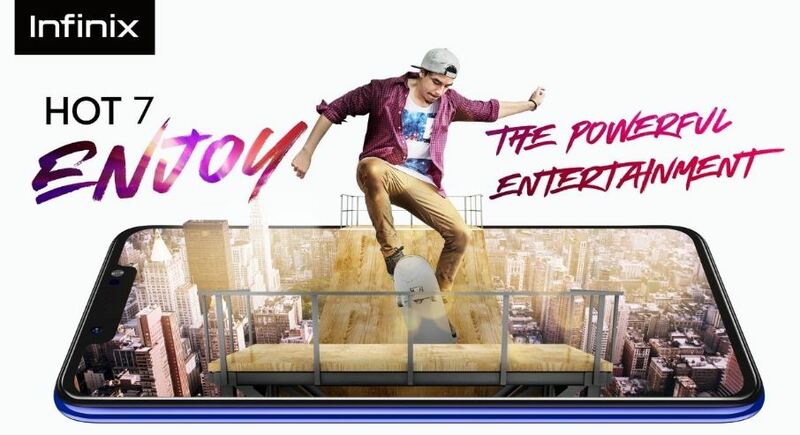 This feature has also been implemented in HOT 7, with both via fingerprint and facial recognition unlocking within 0.5 seconds, your privacy and data are secure.Known for stylish designs, Infinix introduces Hot 7 in four color schemes: Midnight Black, Champagne Gold and the first gradient design – Cosmic Purple, Infinix HOT 7 is a top choice for a powerful entertainment experience.